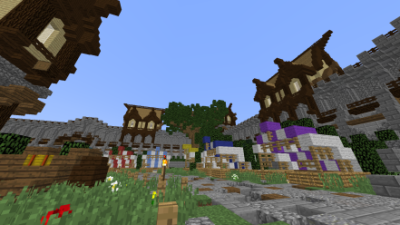 TrollCraft - Home - Welcome to Clans! What is Clans? Clans is a combination of different game modes in which players can create their own Clan, form Alliances, raid Enemies, and More! We have custom programmed, custom textured cannons that fire TNT up to 64 blocks from you with just the click of a button! There's a twist! You must kill the enemy team 25 times more than they have killed you. Once you hit this magical 25 warpoints you are able to open their chests and fire TNT at their base to get to them! Our map will be 2560x2560 blocks, incorporating an amazing custom-generated terrain with biomes never dreamed of before! Be sure to Trek for accross our custom borderlands as well, for they may give you what you seek. In general, Clans allows players to party up with others to create a clan/faction. As a clan, you can claim an area of land and create a base. You can choose to make awesome traps and store gear in your base, or to go out and fight others! You can choose to go to war with other factions for rewards and resources. Alternatively, players do not have to associate themselves with a faction and can instead wander around the map, playing alone. Alliances with different Clans are definitely an option, if both sides opt for peaceful relations. Just as easily as one can ally someone, they can un-ally them. Scamming is also allowed to an extent. Currency does exist in Clans! There are multiple ways to get it. Firstly, gold can be acquired by killing other players. 4% of their gold will drop onto the ground, and you can pick it up. That's not the only way, of course. You can trade 100 Gems from main Mineplex once a day for 16,000 gold in-game. Ores will automatically be smelted upon mining, but only if they are mined in the quarry. The last place to gain currency is through farming. Farming was buffed in the latest season once again, and farming potatoes, and especially mushrooms, will get you a hefty amount of money at the shop if some work is put in! Any earned currency can be used at our custom-built shops! You can buy anything from building supplies to TNT here. In the Clans game mode we pride ourselves on our non-vanilla PvP. Once putting on a set of either leather, gold, chainmail, iron or diamond, you can apply skills to weapons and armour using Enchantment Tables. Sets can both be crafted using ores found in fields and around the map, as well as bought from the Shops! These skills can give you increased movement, teleportation abilities, and even do damage to other players! We do not use regular enchantments. In fact, nothing like that exists at all in Clans. Instead, we make use of something called Runes. Runes can be applied to your weapons by dragging and dropping them onto said sword, axe, bow, or piece of armor to give them an enchantment. Fire Aspect and Sharpness type runes DO exist, however they are not as overpowered as in normal PvP. They will increase by at most 1.30 damage (depending on how strong your rune is, power determined randomly upon applying to weapon) meaning non-legendary items will never do over 8.3 damage! There are many other custom enchantments such as runes that will give you speed 2 for "x" amount of seconds when you hit someone else, or slowness for that matter! Currently, the CTWs are in development. However, I am pleased to say it's going quite well. At this time I'd like to give you a bit of fore-knowledge (leakz) about them. To obtain these weapons, you will have to kill the almighty boss in our custom-created mob arena. As of yet the entrance has not been decided (whether to be a warp, walk-in, teleport pad- etc). Now, the CTWs are split into two categories. Mythical Weapon and Legendary Weapons. Next, we've got the Legendary Weapons. Legendary development is ~ 50% complete, both in texturing and coding. You'll want to grind events for them as legendaries will have an incredibly low drop rate. To finish up, I'd like to briefly speak about Events. There will be 3 separate types of events. Supply Drops, Bosses- and the Ultimate Boss. Incorporated will be amazing cut-scenes whilst fighting the boss (to improve gameplay experience). Remember, that ultimate boss is almost never going to spawn and is the only way to obtain the best Weapon in clans- The Mythical Weapon.